This is the bottom of my passengers door, with the wood being in pretty poor shape. 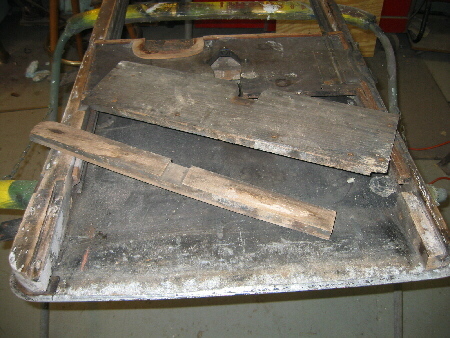 The two pieces of wood laying in the middle of the door were easily removed from the bottom since they were rotten on the edges. Like most doors from this era they were built with a wood frame and a steel skin attached to the outside. Aluminum skins were used on Rickenbacker's 4 passengers coupe bodies, hence your looking at an aluminum door skin. 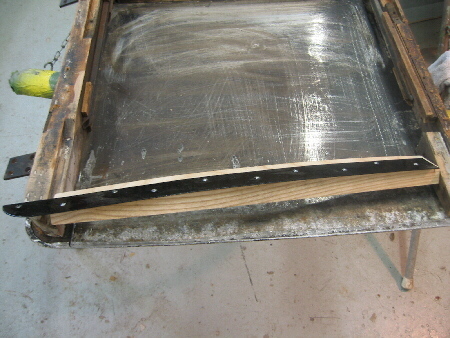 Here you see my new lower outside door skin brace with the steel edge attached to it for the skin to fold over on. It's laying upside down so you can see the steel edge which has been reattached to the wood brace. This the original steel piece, sandblasted, and POR15 painted onto it. 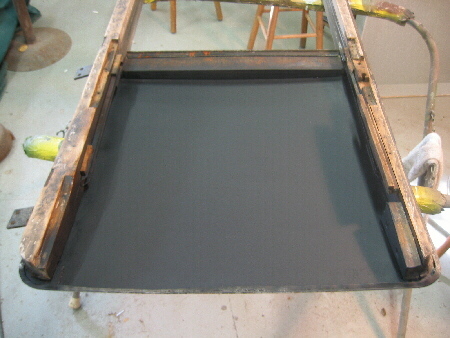 Before I started attaching any new or old wood back in the door frame I sanded and primed the back side of the door skin. I used an epoxy primer here since it has the good adhesion characteristics to aluminum. Coating the back side of this door to seal moisture and the elements out is very important. Aluminum doesn't rust, but it does break down just like a steel panel. You can have an alkaline reaction start which will eat right through the aluminum just like rust on sheet metal. Now with my two lower braces cut and fitted I'm ready to installed them. 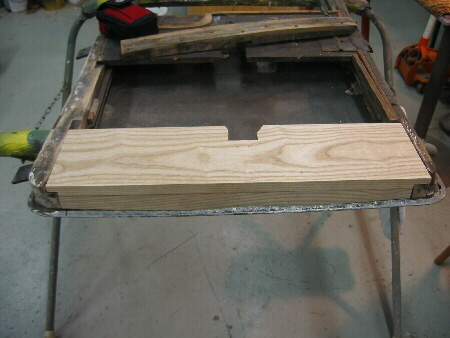 It is very important to cut and fit these parts over and over again until your satisfied with them. Trimming and hand sanding them until the fit perfect is key: Don't get in hurry, this wood isn't cheap. All the replacement wood I'm using in the doors is hard, dry, ASH.